Dressed all in black and preparing his diving gear with loud zips and clicks, George Sarelakos looks like he’s part of a Greek naval operation ready to storm an island or take down smugglers. In a heavy rain, they struggle to clamber off the rocks along a stretch of coast south of Athens favored by day-trippers looking for a nice place to swim within driving distance of the Greek capital. 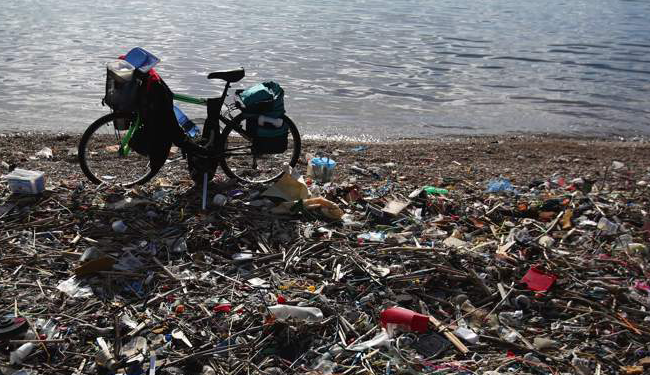 In a 2015 study, researchers trawled five coastal areas in the eastern Mediterranean and found that 60 percent of the marine litter detected was in the Saronic Gulf bordering greater Athens. And 95 percent of that trash was plastic, much of it single-use items like supermarket carrier bags or water and soft drink bottles. Only 16 percent of trash is recycled here, compared with the EU’s average of 44 percent. Nearly everything else ends up buried in trash dumps. At Fyli, the country’s largest landfill on the outskirts of Athens, bulldozers constantly reshape mountains of garbage in a quarried hillside, squeezing out a dark liquid called leachate to leave enormous stacks of brown-coated plastic. A steady flow of garbage trucks is coordinated by loudspeaker, and their entry is accompanied by packs of seagulls ready to swoop on the fresh new trash.